The Tire Pressure Monitoring System (TPMS) monitors the air pressure of all four tires. If the air pressure of one or more tires is too low, the system warns the driver by indicating the tire pressure monitoring system warning light in the instrument cluster and operating a beep sound. 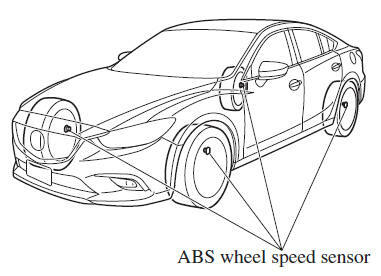 The system monitors the tire pressures indirectly using the data sent from the ABS wheel speed sensors. To allow the system to operate correctly, the system needs to be initialized with the specified tire pressure (value on the tire pressure label). Follow the procedure and perform the initialization. The warning light flashes when the system has a malfunction. Each tire, including the spare (if provided), should be checked monthly when cold and inflated to the inflation pressure recommended by the vehicle manufacturer on the vehicle placard or tire inflation pressure label. (If your vehicle has tires of a different size than the size indicated on the vehicle placard or tire inflation pressure label, you should determine the proper tire inflation pressure for those tires.) As an added safety feature, your vehicle has been equipped with a tire pressure monitoring system (TPMS) that illuminates a low tire pressure telltale when one or more of your tires is significantly under-inflated. Accordingly, when the low tire pressure telltale illuminates, you should stop and check your tires as soon as possible, and inflate them to the proper pressure. Driving on a significantly under-inflated tire causes the tire to overheat and can lead to tire failure. Under-inflation also reduces fuel efficiency and tire tread life, and may affect the vehicle's handling and stopping ability. The TPMS malfunction indicator is combined with the low tire pressure telltale. When the system detects a malfunction, the telltale will flash for approximately one minute and then remain continuously illuminated. This sequence will continue upon subsequent vehicle start-ups as long as the malfunction exists. When the malfunction indicator is illuminated, the system may not be able to detect or signal low tire pressure as intended. TPMS malfunctions may occur for a variety of reasons, including the installation of replacement or alternate tires or wheels on the vehicle that prevent the TPMS from functioning properly. To avoid false readings, the system samples for a little while before indicating a problem. As a result it will not instantaneously register a rapid tire deflation or blow out. The size, manufacturer, or the type of tires is different from the specification. The size, manufacturer, or the type of a tire is different from the others, or the level of tire wear is excessively different between them. A run-flat tire, studless tire, snow tire, or tire chains are used. An emergency tire is used (The tire pressure monitoring system warning light may flash and then continue illuminating). A tire is repaired using the emergency flat tire repair kit. The tire pressure is excessively higher than the specified pressure, or the tire pressure is suddenly lowered for some reason such as a tire burst during driving. The vehicle speed is lower than about 15 km/h (9.3 mph) (including when the vehicle is stopped), or the drive period is shorter than 5 minutes. The vehicle is driven on an extremely rough road or a slippery, icy road. Hard steering and rapid acceleration/deceleration are repeated such as during aggressive driving on a winding road. Load on the vehicle is applied to a tire such as by loading heavy luggage to one side of the vehicle. System initialization has not been implemented with the specified tire pressure.